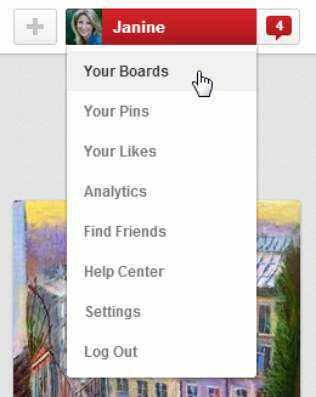 With your Pinterest profile set, you can create as many boards (collections of pins) as you like. Boards are quite handy for organizing your pins. 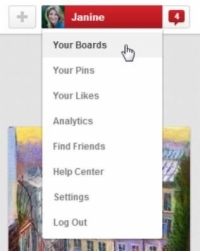 And you can name your boards anything you like! 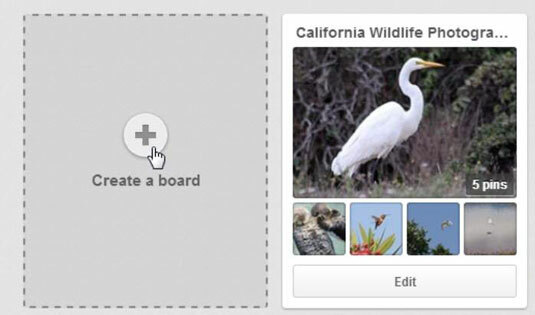 1Open Pinterest in your favorite web browser. Log in to your user account. 2Click the button with your profile name. It’s located at the top right of the browser window. 3From the drop-down menu that opens, choose Your Boards. Your main profile page opens, showcasing all your boards. 4Click the plus (+) sign in the middle of the gray board that reads Create a Board. 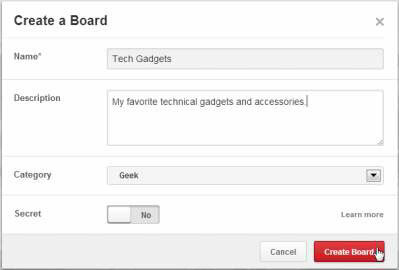 The Create a Board dialog box opens. 5Enter a title (name) and description and then choose a category. 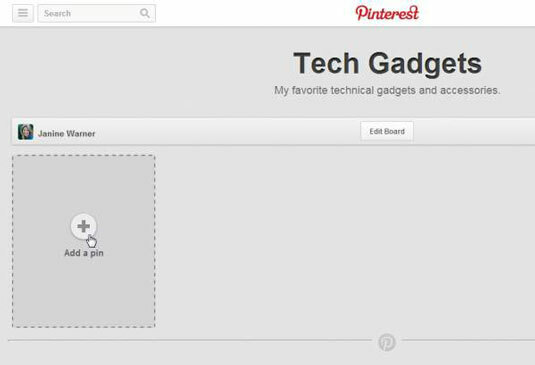 You have the option to keep your Pinterest board set as secret, meaning that other users cannot see it. This is great if you’re working on a collection you’d like to keep to yourself, such as a list of gift ideas. These categories help users search for the pins that interest them most. Some of the most popular categories include DIY, crafts, and recipe-related categories. Although there may be many pins competing for attention in these popular categories, there are also millions of users searching for this content! 6Click the red Create Board button. The new board is created. 7Populate your new board. Click the plus (+) sign above the text Add a Pin. Pin images and videos to the board.